There is some twisted, unnatural evil lurking in the Ghost Shrine. Can you survive, when everything is trying to kill you? 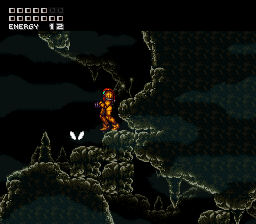 In Super Hauntroid, Samus is tasked with clearing some spooky spectres out of a cave. And that's pretty much it. It's a very short mission (to clarify, my clear time is 6 *minutes*, 47 seconds, not 6 hours), as the game world is basically just one large room. It's little more than a tech demo when you get right down to it. However, said tech is kind of interesting. Much like in Metroid 2, you're given a target counter and have to seek out and destroy all the targets until the counter reaches zero, which will allow you to move onto the final zone. Upon destroying certain targets, they will bestow new abilities upon you. You don't even have to pick up any items: they'll simply be installed into Samus' suit automatically once the target is eliminated. 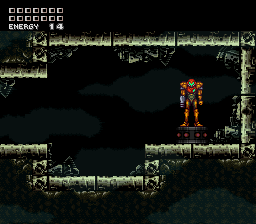 It's just kinda neat to see new gameplay systems like this in Super Metroid. Of course, that's assuming you can find all the ghosts, as it's not always clear where and how their appearance is triggered. It does make it feel more like a hunt -- like the creatures are hiding from you -- but having to retrace your steps, occasionally finding new targets in places you've already been, is a bit awkward. Hauntroid makes a few other tweaks to SM's gameplay as well, and they're kinda weird. The physics on wall-jumps have been altered, as they force Samus further away from the wall than usual when she executes them, making it harder to gain height. You can also only lay a single bomb at a time when in morph ball mode. These seem like changes that were done to eliminate or reduce sequence breaking, but there's very little sequence to break in the first place. I'm not sure why these changes were made, and they cause a tiny bit of annoyance when you're just trying to recover from a little fall and don't wanna backtrack so much. There's also a teleporter, which is a cool idea, but aside from the sound it makes when you activate it, you can't even tell it's done anything: your immediate surroundings don't change at all upon using it. I had to use it several times before I realized what it was, as you'll only notice you've been whisked to a new location if you step into the teleporter and then walk away from it. So yeah, Super Hauntroid a very brief diversion with a few neat code tweaks and graphics/sound modifications, but that's all. Technically impressive, but the gameplay isn't very engrossing, and the whole thing feels more like a tiny snippet of a larger project than a standalone hack. And it's just a tad too cutesy to be particularly creepy either. Innovative and fun little hack.